At SOS Survival Products, Inc., our goal is to deliver your purchase in the quickest and most economical way possible. We review each order individually, factoring in destination, weight and size of items. Shipping charges and delivery methods may be altered after our review if consolidating items in your order will provide better shipping rates and transit times. SOS ships via UPS. Fed EX, US Postal service and various trucking companies depending on the size of your order. For special shipping and/or handling instructions please contact us directly at 800-479-7998. Shipping Costs will depend on the shipping option selected, and the weight and dimensions of the item(s) purchased. If multiple items are purchased, in most cases they will be shipped together. SOS has negotiated pricing with several package and freight carriers providing you with multiple options to choose from. Occasionally, items ordered cannot ship by the shipping method selected at the time of purchase. If this situation occurs, you will be contacted and provided with an alternate shipping method. With your approval, the order will be shipped using the alternate shipping method. Please double-check your address for accuracy when ordering from sosproducts.com. Addresses entered incorrectly can delay or prevent a shipment. Complete address including: Suite #, Apt. #, Rm. #, Mail Stop #, etc. Company name and department if applicable. Delivery hours and/or special insurance requirements. Please note: If these specific instructions are not provided, you may incur additional charges. When the carrier returns undeliverable packages to us we will issue a full refund excluding shipping charges. Please allow 7-10 business days for funds to be returned to your credit card account. These undeliverable packages will not be reshipped. A new order must be placed for the returned item(s). 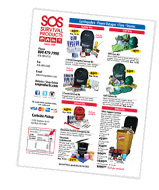 SOS Survival Products, Inc., can ship to most addresses in the domestic United States. PO Boxes can be used if the items shipped weigh less than 4 lbs. If the package exceeds 4 pounds, a physical address must be provided. International shipments are not available. Standard estimated arrival time once an order is placed is 5-10 business days. Once your package has been picked-up by the carrier you will receive a shipping notification via email. Use the tracking number provided to check the status of your delivery. Any order containing a large number of kits, custom made-to-order kits, imprinted items, or large trucking orders requiring multiple pallets, may add to the processing/ship time. If you require items by a specific date please advise us when placing the order and every effort will be made to meet reasonable deadlines. If you have any questions or concerns about getting your order within a certain time frame, please let us know at 800-479-7998. Note that estimated delivery dates are approximate and can change based on extenuating circumstances beyond our control. When your delivery is received, it is your responsibility to note the condition of your shipment and record the piece count at the time of delivery. Any damages or shortages must be reported to SOS Customer Service within 3 business days of receipt. Any discrepancies after that time frame may be considered void.